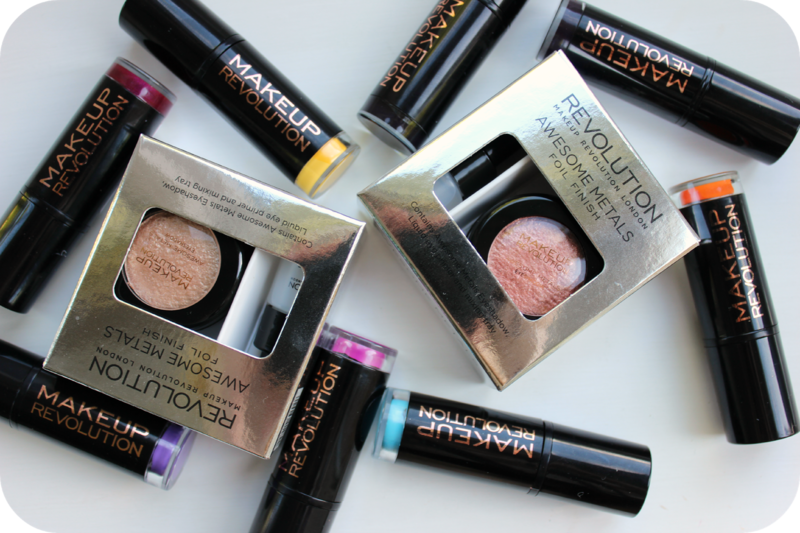 What I love about Make Up Revolution is the variety and of course the price! But where else can you get a bright blue lipstick from for a pound! 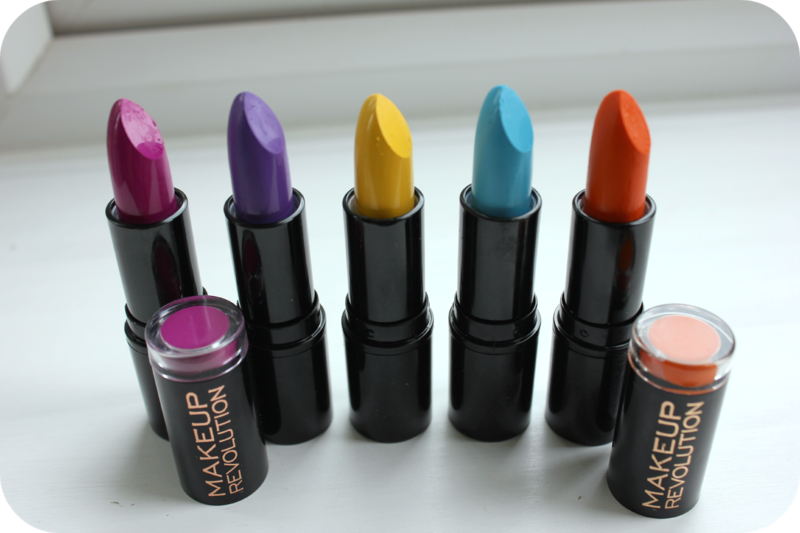 Its been compared to other brands such as MUA, Which yes there's a price similarity but the range from Make Up Revolution in my eyes is a lot broader. These were the first things I picked up, I'm pretty sure these are a dupe for the Stila Magnificent Metal Foil Finish Eye Shadows, Now for £4 I wouldn't pay £24 for the Stila ones, Sorry Stilla!, as these are amazing! You get a little mixing tray, the Awesome Liquid Eye Primer and the actual eye shadow, The shadow its self is so soft and creamy, they can be sheered out, which look so beautiful as well as being packed on. When sheered out it reminds me of the very sheen, gloss eyes that are around on all the catwalks recently. I was a little confused by the eye primer as I thought it would be similar to the Illamasqua Mixing medium, but I think I'd definitely use it as a primer and the Illamasqua one as a mixing medium. These aren't going to be everyone's cup of tea, but for me starting to build a pro kit, these are perfect! I must admit I'm not entirely sure about the yellow, but these would be great for editorial looks. 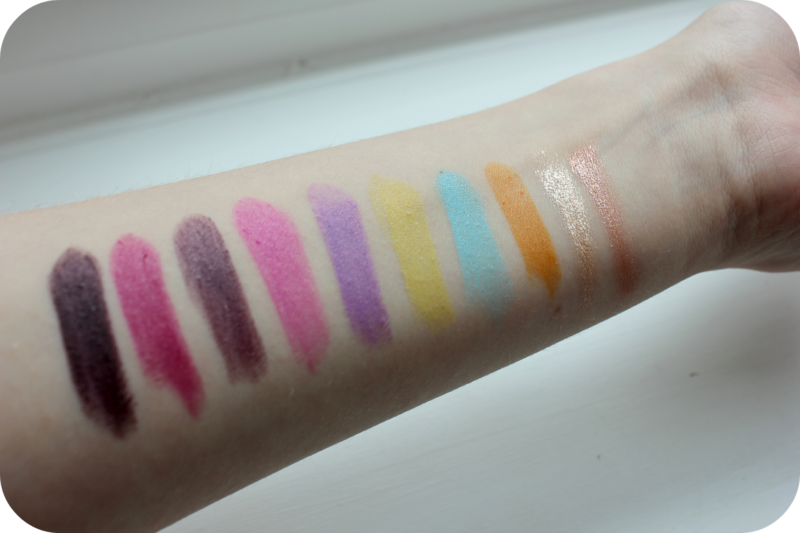 I love how they're o different to anything anyone else in this price range are doing, its such an easy way to experiment with colour without having to shell out £15+ to try this. They're the same formula as all the other lipsticks, so if the others are as super pigmented, soft and long lasting as these are I think I need to add a few more to the collection. I bought these as a whole collection, so you pay £4 Instead of £5, basically getting one free, you can buy them separate though if there's colours you don't want. 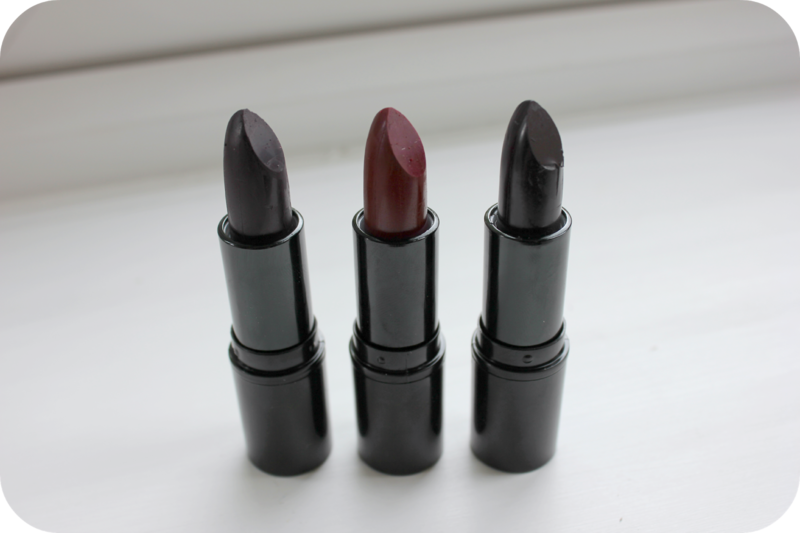 Over the winter I've gotten more into the darker lipstick shades, Maybe its not around the right time of year for these at the moment for me, but for just £2 I had to pick them up. They're just as creamy and pigmented as the Scandalous Collection, I don't find them to drag at all too. Plus the middle shade, Rebel with a Cause, is a dupe for MAC Rebel! The only problem I have with all the lipsticks is that the lids come off some very easily but when they're a pound I cant really complain, the other thing is that the coloured end doesn't come off like with the MUA lipsticks. Again because I bought them as a collection I got one free, you can by them separate too. I thought I'd add in a picture of the eye make up that I did with the Foil effect shadows, Unfortunately taking it with my iPhone has meant its not the best quality but it gives you an idea of what they're like. I would definitely recommenced checking out Make Up Revolution, I've seen a lot of talk about their dupes for the Urban Decay Naked Palettes and Electric Palette plus maybe some MAC Mineralise Skin Finish Dupes too! I can see another order happening maybe haha! The Rebel With A Cause lipstick looks beautiful! I love the look of the foil shadows too, I've not heard much about them til now but the look you created is amazing! Wow a great haul! I need to place my order soon! That eye make up looks so pretty! 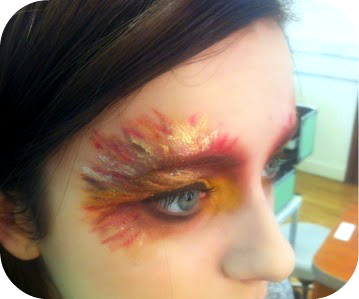 Just shows how pigmented the shades are and how creative you can be with them! 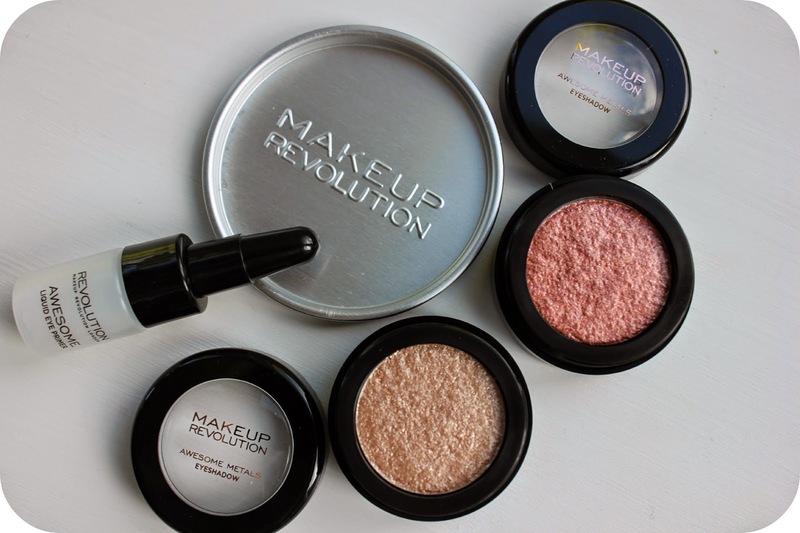 i really need to try out some makeup revolution products heard so many great things about them! In love with the shades of metal eye foils, i must check them out! ooh i love that bright pink lipstick! ps. check out my £300 RayBan and beauty goodies giveaway! click here. I have the yellow and orange lipsticks and I agree, they aren't for everyone, but they are amazing for creating fun looks! I'm a huge fan of Makeup Revolution at the moment. 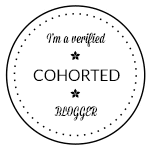 I've got a stack of their palettes and other bits and bobs, and I've reviewed so much of their stuff, I can't say a bad word about it all! The vamp lipsticks look amazing! 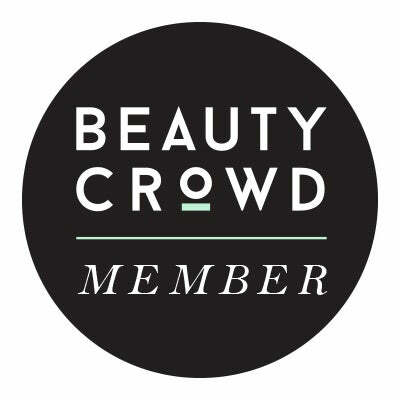 Definitely will be checking out makeup revolution!